It was back in 2006 when I first set foot in Techno India. That was supposed to be the college where I learn how to be an Engineer in Electrical engineering. That also was the college where I spent a good number of days of my life, shaping up to be what I am today. First, just a little preamble. The idea of a tech-fest (technical festival) was very new in 2006-07. 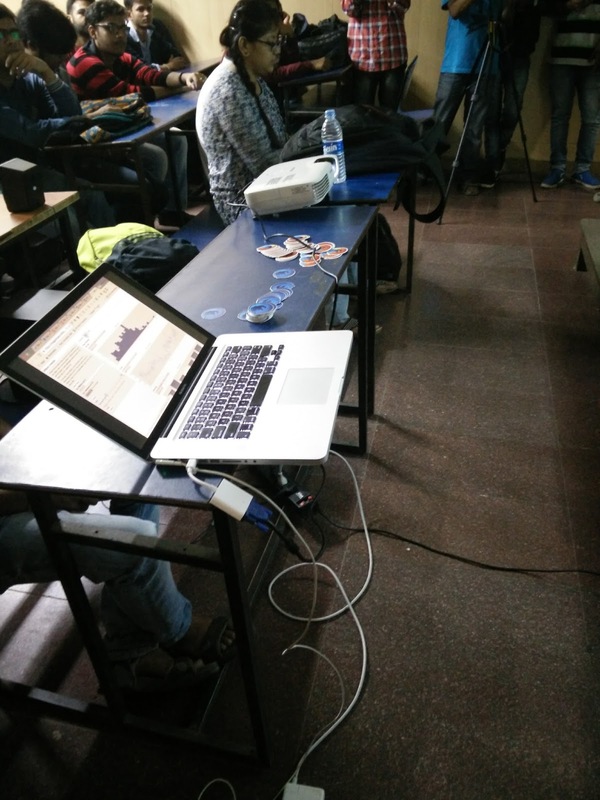 Even the word was synonymous with the event IIT Bombay organized yearly. Techno India was a really new college on the block, mostly afraid of taking any new steps, but with students who wanted to reach the sky, push the envelope beyond Horizon. Some of them formed the science club Geekonix and started Edge, the annual tech-fest, against all odds. But today we are not going to talk about that. Fast forward 10 years and those students, now in various stages of their lives, decide that it's again time to do something to kindle and guide the interest in students in new technologies. And hence GeekXtalks, a talk series was born. Which we are going to talk about today. After my talk at GraphicalWeb while chatting with a few others, I was invited to talk about IoT (Connected Devices) at the second chapter of the series. I did have a co-presenter with me. Ankan Roybardhan from RF system Integration Engineer in Wireless Design Org. of Apple. And I was representing Mozilla (yay!) as a Mozilla TechSpeaker. 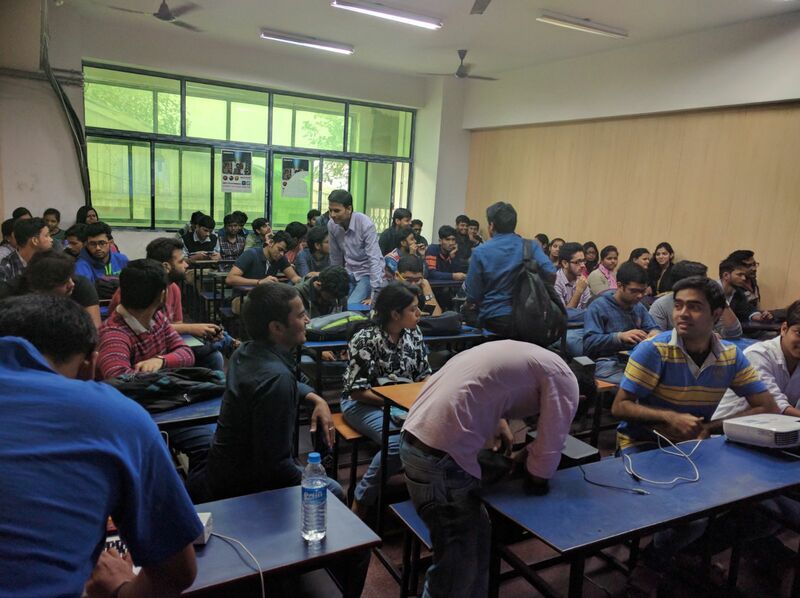 The event took place at Techno India Salt lake campus. It was a holiday hence we had reservations about how many students would attend. We had an estimate of around 80 students who will be attending. So we were pleasantly surprised to see the room completely filled up and people standing! I had planned on a more hands on and involved talk with "Web of Things". How it all connects. But decided against it after a little bit of chat with the students and getting to know their interest. So I did a fall back on one of the talks that I had delivered in OpenSource Bridge at Portland and with Dietrich(Platform Manager, Mozilla Corp.) in Linux Foundation OpenIoT Summit 2016. You can see the video of the talk below. In this talk we take on the hype about IoT. The expensive devices, the ‘another’ new IoT device which talks to…only it’s own application. The awesome windows blind that can learn your moods or the overly complicated raspberry pi that you have to code to get your hack going. 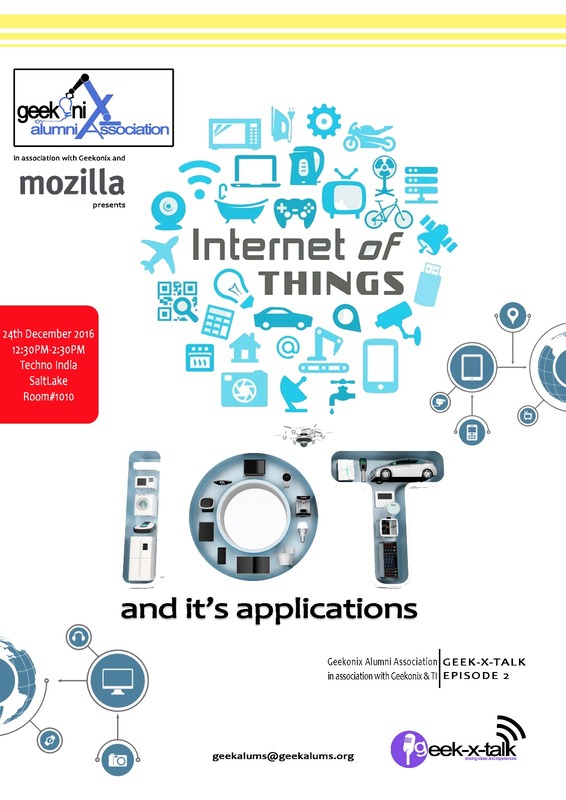 In this talk we will show a simple yet reasonable way to get started with IoT, using your old android/firefox os mobile/device that may be collecting dust in a shelf (which you don’t use) and turning them into something really interesting which can do tasks for you which otherwise your expensive “smart home” product would have done with more of expensive proprietary hardware. We will talk about what it means to us as open web citizens to have control over our IoT devices, how we can re-use old phones to have same functionality and show a sample code framework that you can already use to achieve this! And how can a talk complete without some swags. Once we had that out of the way (and the Pizza courtesy Mozilla) Ankan got to work explaining more about the works for an electrical, electronics or even mechanical engineer in the vast space that is IoT. We were overwhelmed by the diversity of our audience. Starting from computer science and Information Technology undergraduates, we had students from electrical, electronics asking us about the scope of work in the field and how they can contribute. That intrigued us to show a few of our hobby projects involving wearable devices. And at the end, of course, Ankan was swamped by questions about career in Apple and higher education. However, if any of you are interested in the Web of Things talk(what was initially planned), then here is the slide. Leave comments on any questions you might have and I will be glad to answer.